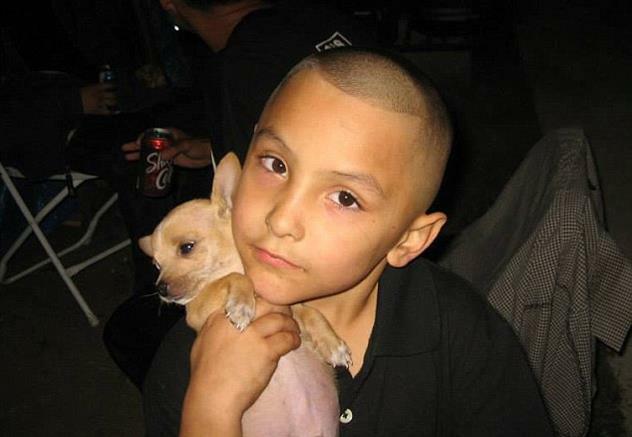 LOS ANGELES – Two social workers and two supervising social workers were fired by the Department of Children and Family Services over the tragic death of Gabriel Fernandez, County Supervisor Michael Antonovich announced Tuesday. Three additional DCFS workers were either reprimanded or received poor performance ratings in their personnel file, Antonovich stated. Eight-year-old Gabriel died on May 24, two days after he was rushed to the hospital with a fractured skull, cracked ribs, burns and bruises throughout his body. Gabriel’s mother, Pearl Fernandez, admitted to being present while her boyfriend, Isauro Aguirre, repeatedly abused Gabriel and caused his injuries in their Palmdale apartment. 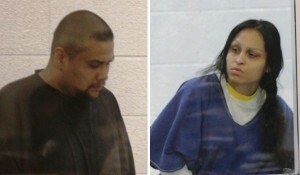 Aguirre and Fernandez are each charged with capital murder and could face the death penalty, if convicted. Mother and boyfriend were each charged with one count of capital murder in connection with the deadly beating. Gabriel’s plight has drawn national attention and has sparked outrage throughout the local community, with many residents believing the little boy could have been saved if social workers intervened. There was a public outcry for firings, and even criminal prosecution, when it was disclosed that DCFS had conducted six prior abuse investigations regarding Gabriel’s mother, yet DCFS failed to remove Gabriel from her presence. Pearl Fernandez, 29, and Isauro Aguirre, 32, are each being held without bail in County jail. They’re due back in court on August 13 for a scheduled arraignment on the capital murder charges. Prosecutors will decide at a later date whether to seek the death penalty. 52 comments for "Four social workers fired in death of Gabriel"
I see all these people claiming they’ve been screwed over by DCFS or the courts…but if you were not doing dope, had a job and didn’t shack up and have kids with bottoms feeders and parolee’s you wouldn’t have most of these problems. I was arrested for reporting a foster child’s abuse. I have been harassed and/threatened by DCFS Workers and sheriff’s deputies for filing complaints when they failed to protect the foster child, so they arrested me. I have had one social worker after another tell me how I fail to see the big picture over the past year since the arrest. Maybe if they were working instead of at my house trying to intimidate me one of them may have been able to protect and save that baby. Their self interest is paramount and the children of Los Angeles County are a means to an end. They should all be fired, especially Annette Richardson. Let’s hope it’s Dave Collins, Vicki Stephans. I see Dave Collins at Food for less buying liquor (during business hours) and kids complain about Vicki Stephans yelling at them. I feel sorry for the social workers who were fired – they are scapegoats. We all feel bad for Gabriel, but I feel that if not for the abuse that occurred on that final day, Gabriel would not have been eligible to be removed from the home based on the complains filed up until that day, and DCFS could not have predicted that final abuse would happen. 1. People who call DCFS to get revenge and fabricate stories of abuse. 2. Kids who lie to DCFS because they want to live with a less strict relative. 3. Sometimes kids fall down while playing, but someone notices the bruises and calls DCFS and the social worker has to figure it all out. So.. DCFS workers sometimes have to give parents the Benefit Of The Doubt.-know why? because taking someones kid away is not some small thing – its HUGE and can be DEVASTATING for the kid. – oh and lets talk about money too – how much does it cost the county/state to raise an 8 year old until hes 18? I bet that’s some huge amount of money that California has no problem paying for, heck the state has no money problems right? Truth is, the guy got too drunk… or too high.. or too angry.. and lost control and killed Gabriel.. Any rational human would know you can’t beat on a kid like that and think you will get away with it. Rest In Peace Gabriel…. you were robbed of a full life.. But I blame the person that killed you.. not some agency. YES, I believe there is corruption in the courts too. One time I was talking with a social worker, and she said she was unaware of a court hearing that took place, as she was telling me “when the court date comes up, blah, blah, blah, then I told her there was a court hearing yesterday, she said hmmmm really, wow, I was unaware of a court hearing. THis made me believe that there is people in the court doing some serious corruption. like having court hearings without even some of the social workers knowing. CRAZY, There needs to be a system set up where this can’t happen!! People from DCFS & the LASD who were involved in this case need to do jail time. THE SUPERIOR COURT DEPENDEANCY REFEREE MORDEVSKY, SHOULD BE INVESIGATED. I AM THE GRANDMOTHER OF 4. I HAD CUSTODY OF MY GRANDKIDS DUE TO MY DAUGHTERS DRUG ADDICTION AND ABANDIONMENT OF HER CHILDREN. SOCIAL SERVICES CONTACTED ME, ANTELOPE VALLEY SOCIAL SERVICES GAVE ME GUARDIANSHIP OF ALL 4 OF THEM FOR OVER TWO YEARS. THEY DID GREAT WITH ME. THEN REFEREE MORDEVSKY MADE THE DECISION THAT THE MAN MY DAUGHTER LIVED WITH, SHOULD BE MY GRANDCHILDRENS CARETAKERS. THIS MAN HAS 6 CHILDREN OF HIS OWN,HE AND HIS MENTALLY ILL WIFE HAVE ABUSED MY GRANDKIDS WHILE THEY LIVED WITH HIM. BUT EVEN THOUGH THIS WAS REPORTED TO THE AV COURT, (MORDEVSKY) I REPORTED, THE KIDS TELLING ME OF ONE OF THIS MANS KIDS SEXUAL ABUSE OF MY YOUNGEST GRAND DAUGHTER. ALL IN WRITTING TO THE JUDGE, SHE GRANTED THIS MAN LEGAL GUARDIANSHIP. I HAVE IT ALL IN PROOF FROM AV DEPARTMENT OF SOCIAL SERVICES. NOT ALL BLAME IS ON THE SOCIAL WORKERS. I HAVE HAD NO LUCK IN GETTING LEGAL HELP IN FIGHTING THIS JUDGE/REFEREES RULING. I DO NOT HAVE MONEY TO FIGHT AND THE SOCIAL WORKERS NOW DO NOT REPRESENT ME ANY LONGER SINCE THE KIDS GONE. I FEAR FOR THEIR SAFETY. I GET NO HELP FROM DCFS. JUST, I AM SO SORRY THIS HAPPENED PER MELISSA PITTS, ONE OF THE GOOD SOCIAL WORKERS WHO AT LEAST TRIED TO HELP. Mordevsky was fired, apparently along with all the referees at AV Dependency Court, due to *cutbacks*. I also had to deal with that imbecile & she has screwed up EVERY Case I’ve heard about. ALL the cases she handled need to be reinvestigated. There should be criminal charges against those who failed this little boy. Many posts & articles here have brought up numerous times friends, family & teachers have tried to report this child in danger. The DCFS, along with the sheriffs who were on scene should be accountable for their inaction. As professionals social workers have the duty to protect those children that are in harms way. There were obvious warnings in regards to this child’s well being and the system failed him. If you are in a profession that involves the lives of others you take an oath to protect those who cannot protect themselves. If you are in this field to receive a paycheck then this is not the job for you. These types of sanctions should be imposed and followed to the fullest. Everyone that failed this child should be in the unemployment line. I can tell you from the experience of my ex abusing my kid that the sheriffs dept won’t do a damn thing “until the parent acts on the threats to harm the child”. Basically they stand there doing nothing until it’s too late. I heard he had bb’s in his chin, and in his private area. CRAZY!! No one has commented on the fact that when a referral is called into the child abuse hotline, it is cross reported to the Police at the Jurisdiction in which the abuse occurred. It is exactly so that their is a checks and balance situation in place. There is a lot of blame being thrown at the Social Workers. What about the police? If they had investigated the case and had seen the abuse, wouldn’t they have chosen to arrest the two, and take the child into custody? Or did they just not respond? Stop the blame game. Both departments failed. Most of you are ridiculous. You hunt down the cooperative & dog them for ever. You are so full of yourselves you are blind to what’s in front of you. This child died because of horrible parents & a lousy system. If you aren’t part of the solution then you’re part of the problem. These parents looked like they could be gang related, and Im thinking that there could me some people in the DCFS that could be getting them to do deeds for them, to keep from getting into trouble. I have dealt with DCFS for many years. I find it difficult to believe that Children Services is ever for a parent. I fostered for many years in L.A. County and adopted some children. Never had a complaint from the children placed in my home, until one day the female i adopted went to DCFS and told them i beat her with a belt buckle, socked her in her chest and stomach (all after she went missing for 3 weeks), they actually believed my child and detained her (to find out later her accusations were false). She at 14 wanted to run the streets, used drugs and alcohol. My point is DCFS believe what children say before adults. When an adult (mandated reporters:teachers, foster parents, neighbors etc.) report abuse they need to jump with a quickness. I have a friend who recently had her daughter detained (because the daughter was sneaking out the window at night and had not been to school for 3 weeks)mom took her iphone and her daughter went to the police station and told them she was beaten and was in fear of her life. Then the daughter decided she did not want to return home (she can do what she want to do while in a group home). What ever happened to letting a parent be a parent? This system is very broken. God rest Gabriel’s soul (he is no longer suffering). Unfortunately Gabriel was living with 2 people who were obviously mentally ill, 2 adults beating and torturing a defenseless 8 year old child. Children services need to concentrate on the real child abusers (it would be 1000 instead of 35,000 children in the L.A. County System). Leave parents alone who are trying to raise their children to the best of their abilities. We love our children but have lost them to this warped system. Social Workers need more advanced training so that they will be better able to identify child abusers. They harass non abusers and send them through a lot of unnecessary changes, they destroy families. I hope that they all get fired. I know Social Workers that quit their jobs because of the things that go on within Children Services (lies in reports, covering their behinds, forgetting they are Humans and think they are GOD). These workers are now letting their Union help them keep their jobs, what a joke. Many children have died because of Children Services. How many other children were detained the day Gabriel died because they got a simple spanking? One thing about it, all Social Workers will one day have to answer to GOD. Think about the things you do while sitting in that Social Worker position. Are you really there for the children? Every one know that Children Services is all about money. When i was a kid i only knew of Orphanages, or someone in the Community would take a displaced kid and raise them as their own. Boy, the good ole days. actually dcfs in AV needs to get it together! i know about a couple that was geting investigated they and their newborn tested positive for meth and they had 6 other kids that were being neglected living in a room and dcfs still let them keep the kids by the way those kids had never been to the doctor and were not in school!!! [removed] i know another couple who kept on geting investigated and they didnt need to be the kids wer ok both parents working kids well treated? wtf and i know the names of those stupid social workers too! It is good news, but what about the rest of the DCFS workers? Shouldn’t the government take this duty away from this negligent agency as too many children are suffering needlessly. The workers decided to work for DCFS so they knew what they were taking on…a large workload. However, they are not being paid to punish children by keeping them in abused homes. One of the main reasons for quitting as a social worker for child welfare and went to work for the hospital. The courts are also to blame as I fought so hard to keep one beautiful 3 year old boy out of an abusing home but as usual the courts returned him to the parents. My first expiration when I rotated my duties to the emergency room was this beautiful 3 year old boy that fell from a three story apartment building down onto the concrete ground floor. Why do the courts continue to return these children to an abusive home? How I agree. I grew up here in the AV. Fifty five years ago, each parent felt it their duty to oversee each one of us kids. Not so much any more. You would change your.words if you saw how Gabriel came into the ER. Worse than your nightmares and worst than your imagination, worst than the.media has released. Did he have BB’s in his body? I heard he was pretty bad, poor lil guy, he looked like a cute lil boy. Its too bad what happened to him. People need to start doing right in there life because this is really sad. I hope these two are in public population! In a low-socioeconomic area, like Lancaster/Palmdale, it would be a real benefit to start teaching highschoolers the facts of life regarding domestic abuse. Most women who allow the abuse of their child are in an abusive relationship with a no-good man. They become codependent with their aggressive and domineering abuser and become a non-person who can’t even care for themselves, let alone their child. A large percentage of low-socioeconomic men are abusers and low-socioeconomic women feel like they need a man to survive in the world and make ends meet. It’s a trap. I wish that woman had had better parents herself, who had prepared her for life. I wish she had left the sorry POS of a “man” the first time he hit her or her child or coerced her into disciplining “his way”…There’s financial aid for poor women. They can go to college and leave the assh*** behind. Start a new, good life with their babies…or at least a better one than the alternative. There are many good men in the world, but sadly, they are not in the Antelope Valley. You know its sad. That in this case Child services should’ve protected the child. Yet when a child doesn’t need the protection, they are actually in a stable loving home, the caseworkers will take away the child(ren) without so much as a thought. That poor boy, to suffer like that at the hands of someone, yet five people including his mother could’ve saved him and didn’t. They should have their names published! They would do that with teachers, parents and dr’s, so why not the caseworkers? Where is the justice for this boy and those who truly need it!?!? I feel this exact way! Workers in Leominster, Ma are slacking on their job BAD! I do not have an open case but my sons mother has numerous open cases. She has been supported time and time again over the years for neglect and abuse going all the way back 12years from her first child. DCF worker gave the judge her file for the past year and a half and it was close to 10inches thick! She has 4 baby daddys although I am the only one involved. The children state in the 51a and 51b reports that the mother and her bf hit them and fight infront of them. There have been 3 domestics with them home in the past year in a half and cops came. DCF does NOTHING! They know mother is on drugs.. it is stated in the reports they are concerned with her drug use… This office SLACKS!!!!!! something is going to happen to her 3 other children while she is drugged up and dcf will be at fault!! I finally have my son and she can only have a day visit. NOTHING MORE! Now he is finally safe!!! I am nauseated at the horror of this story. Now that the blood lust of the community has been satiated by four workers being used as scapegoats…Let us turn our eyes to the Sheriff’s Department who were in the home several times previously to Gabriel’s death and did not remove him. What about the in-home therapists those were there once per week? What about the family members who complained about Gabriel’s mistreatment and stood by while he was beaten to death by his mother’s boyfriend. Why not go after them too? Antonovich is so happy to have four workers lives destroyed over the ineptness of the Child Welfare System. These workers were only a few people involved. Why are we not looking at all the other community agencies out there servicing these families and holding them accountable as well? Why are we just stopping with ruining four workers lives? Why don’t we just get out our pitchforks and torches and go on a spree? Why don’t we get off our butts and get out there and vote to make a difference in child abuse laws, child-welfare reform, and mandated reporting responsibilities? Get a grip people…this is not the 1500”s where we burn people at the stake. Look at the whole picture and become an advocate to make a difference instead of sitting on your butts and demanding blood. One question for the 4 social workers. Do you have kids? Then you get the morons who call to report emotional abuse because the kids Father shaved his head because he was suspended from school for upteenth time. Yah…hear…hear. It seems parents who really, honestly try to do what is right, not to the point of abuse, but to the point of discipline, get busted for the dumbest things….like you mentioned….shaving a kid’s head. Why are the names of the workers not being released? I see names of teachers and othes that do wrong released , so why not there’s? Social workers are guaranteed anonymity by law. That law should be changed. I called to report abuse, lancaster office said “what do you want us to do about it?” Seriously! !!! Wth is wrong with this world?? Please don’t give up! Ask for their supervisor , you could be saving an innocent child’s life. Do NOT deal with the following people at Lancaster DCFS: Paul Gaieta, Dave Hinson, Vicki Alexander, John Willey, Jessica Garrett & Jessica Burnias. They all stood by & let my child continue to be abused by her mother, as did Dependancy Court Referee Mordevsky. Add to that list two people at Kaiser Mental Health: Kathy Harris, & Kim Daughty(sp?) & the law office of Tim Martella. All are criminally negligent & they continue to condone child abuse. I could give you list of names of workers at the Lancaster office whose only qualifications seem to be ineptitude, indifference & incompetence. They sure as hell don’t give a damn about kids welfare. You should send that list to the director of DCFS. They can’t hold people accountable if they don’t get the complaints. I have dealt with so many social workers who don’t return calls. I give it a day, then I call he supervisor. I get a call right away. They need to be accountable. Children’s lives depend on it. I have spoken to people at Phil Browning office & filed complaints. Guess who investigates DCFS? They investigate themselves & findings are confidential. You may as well talk to a fence post for all the good it does. Antonovichs office is just as useless. I called Antonovich’s office to report fraud. A male assistant answered and gave me a number to call for CCRC that was disconnected. I called back and was given another number that was for another agency all together, (Animal Control). I have been reporting this fraud for over 3 years and although I have been told that it is under investigation, nothing has happened and no investigators have come to the house in 6 months. All my notes, names, pictures and contact info for the people I have reported the fraud to, is going to be turned over to a news reporter in LA if something isn’t done by Sept 20, 2013. Kelly G, I did and guess what, they just rerouted the complaint BACK TO LANCASTER OFFICE which a Lancaster Manager investigated. Seems to be keeping it all in-house huh? Yea, the Director did.